I leave with a fully functioning jaw, a returned interest in eating and a confident smile. Stephen set up Dental fx in 2006 after relocating from his previous practice in the south side of Glasgow. He is passionate about dentistry and providing the highest standards of care for all the patients at the practice, he says “I am very proud of what we have achieved in building this clinic and also of the wonderful professional team that we have developed”. Stephen placed his first implants in 1991 and since then, the dental implantology has been his passion and he has dedicated his career to this field of practice. Dental fx has been set up also as a training centre where many courses are run for other clinicians to learn from the team, the skills and techniques involved with implant dentistry. 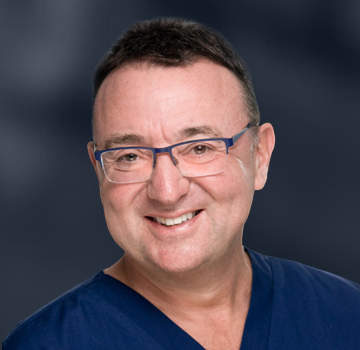 He is widely regarded as one of the foremost implant surgeons in the United Kingdom and this has been recognised by many organisations with a variety of honours and appointments. Included are that he is a past president of the Association of Dental Implantology (UK) and served for many years as their Scientific Chair. Stephen is a Fellow of the Royal College of Surgeons and Physicians and also a Fellow of the American Academy of Osseointegration (AO). He is a committee member of the AO and is Chair of the AO Global Program Committee where he oversees all non-North American activities of the Academy. He is the UK Ambassador for the AO. Stephen is a sought after speaker and lectures internationally on all aspects of implant dentistry, in the UK, Europe USA and Asia. He is on the editorial board of two scientific implant journals, has published many articles and is himself actively involved in practice based research. He works with many companies in the implant industry, on product development and creating contemporary cutting edge solutions for patients’ needs and wants. Stephen has been married to Lucy for 28 years and they have three daughters, Talia (a pharmacist), Carly (a chef) and Alyssa (studying at University). His hobbies are golf, exercise, skiing and most sports.